Sometimes, a home just feels too big or too small. The same can also be said of a neighborhood, city, or town. But when you see the lovely homes for sale on Cypress Island in Palm Beach Gardens, Florida, you will realize very quickly that you have found a living space and a location that is just right. In fact, for the serious boater, it is perfect. Stroll along the tiny island’s main streets under a canopy of live oaks down to the marina, and you’ll see what we mean. Decidedly upscale but without pretense, Cypress Island homes are — not surprisingly — located on a private, secure island in fabulous Palm Beach Gardens, Florida. 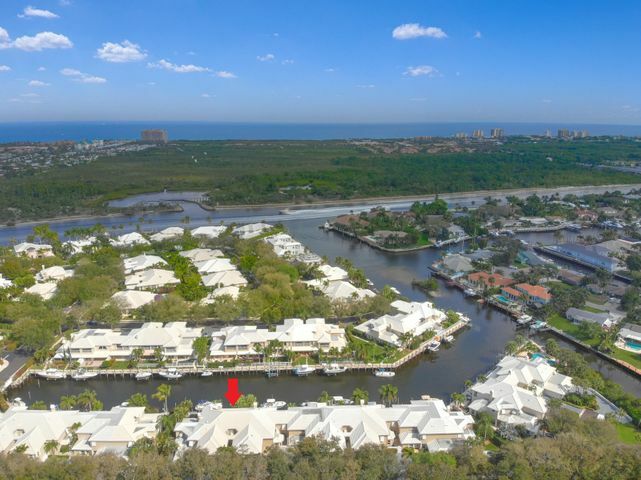 This cozy waterfront community harbors 72 residences, most of which have a canal or Intracoastal facing. You’ll see breezy, West Indies style architecture that may remind you of a place you once visited, but here on Cypress Island, the place is yours, and you are home. The agents of Frankel Realty Group know Cypress Island, and would love to introduce you to your new neighborhood and your new home. Call us today! Residential options on Cypress Island include townhomes and single family homes, with living areas that range from about 1,800 to nearly 4,000 square feet and three or four bedrooms. Single family homes on the water may offer a private dock as part of the real estate. And with list prices from the $300,000s to under $1 million, homes for sale on Cypress Island offer a very attractive value that will make living in the lap of South Florida luxury an easier proposition than you might imagine. You’ll love the pineapple-shaped street lights and sconces on the garage façades that lend a whimsical touch to the twilight and evening hours. Although Cypress Island is a small enclave, it offers fine amenities to its residents. There is a sparkling neighborhood swimming pool, game room, and direct access to the Palm Beach Yacht Haven Marina with private docks available for sale. Reciprocal arrangements have also been established with the outstanding golf clubs at The Bear’s Club and Trump National (both in Palm Beach Gardens) for residents to purchase golf memberships at these clubs with no residency required. Location, Location, Location? Must be Cypress Island! There is only one road to get on or off Cypress Island, making vehicular traffic very light and the living quiet. But for the times you want to go off-island, remember that you are only minutes away from the best shopping in Palm Beach, 150 world-class golf courses, the Atlantic Ocean beaches, Palm Beach International airport, I-95 and the Florida Turnpike. In short, a great location in a great town. When you decide to start living the island life on Cypress Island in Palm Beach Gardens, Florida, the real estate experts at Frankel Realty Group are ready to assist you. We know Palm Beach Gardens and the surrounding areas well, and have for years, which is why you’ll be glad to have us on your side when you buy your Cypress Island home. We look forward to hearing from you.